Everything we think we know about the lap shear joint is wrong. The force needed to break it does NOT depend on the overlap L, and the failure mode is via peel rather than shear. And our intuitions about what happens if we change the moduli, E, or thicknesses, h, of the adhesive or adherend are highly unreliable. Now look at the peel forces. They are zero in the middle, negative towards the end (i.e. the adhesive is in compression) then they rise sharply at the ends, overtaking the shear stresses - so the failure is in peel mode. Now make the adhesive weaker by reducing its modulus E2. In many ways it improves things by reducing stresses! Once again, Adhesion is a Property of the System and in this case the system is super-complex. There's a story at the end of interest to those who don't want the wings to fall off their aircraft in flight. It seems rather obvious that given a lap joint of width b, with overlap L broken by a force F, the measured "adhesion" is F/b.L in units of N/m2. As with so much in adhesion, our intuitions are false. First, above a certain minimum value of L the overlap makes no difference to the strength of the joint. And if you miss out ~2/3 of the adhesive within the joint (making sure it is present around the edges) the strength is also unaffected. So although double b doubles F, saying that the adhesion is F/b (in N/m) is also meaningless. The only thing we can say about a lap joint is the force F required for it to fail. And the failure often has nothing to do with "adhesion" but with yield stresses in shear and/or peel. Peel? Yes, although the lap joint test looks as though it is a pure shear test, there are strong deformations which make it into a balance between shear and peel. In Kendall's experiments, a typical sample was a rubber with modulus 1MPa. The calculation shows the actual force needed along with the equivalent in terms of F/b, i.e. a Peel in N/m. It is easy to see that a bond which is made only of surface energy (so in normal Peel would be ~50mN/m) looks as though it has a strength at least an order of magnitude higher. 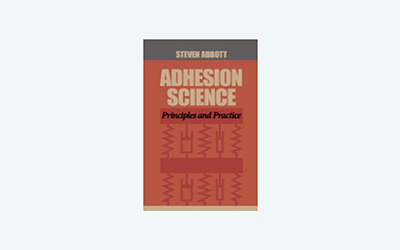 In other words, a measured "adhesion" value can be very misleading about the interfacial adhesion value. Returning to a real lap joint with an adhesive we need a more powerful model. The Goland-Reissner model is a reasonable guide (other models are available) and is much quoted in the testing literature. The equations are far too complex to show here - the idea is simply to build up one's intuition of what is happening in a lap joint. Enter the thickness and modulus of the adherend, the thickness and modulus of the adhesive, the width and overlap length of the joint and the applied force and you will see where the maximum shear and peel forces are and why L makes little difference above a minimum value (though the weaker the adhesive, the bigger the effect of L). Note, as in the Kaelble peel model, that the peel force goes negative (i.e. it is a compression force) some distance from the ends. The nominal stress (Force/Area) is shown as "MPa" to remind us that this isn't a real value because Area = Width * Overlap and above a minimum Overlap the MPa will go down even though the failure will remain constant. It is included simply because so many adhesion values are reported in these meaningless MPa. The Yield Stress, σ, is used simply as a check for whether any of the calculated stresses exceed the value (i.e. Peel Ratio or Shear Ratio >1). Of course this depends on whether the input value is the peel or shear stress - the definition is up to you. For those who want a more sophisticated model I strongly recommend the Joint Designer site. It was created by Prof da Silva's group at U. Porto in Portugal who are world experts in understanding the mechanics of adhesive joints. Their help in refining this version of G-R is warmly acknowledged. Planes are stuck together with glue and a lot of the stresses are from shear. So it makes sense to do a shear test to make sure the plane won't fall out of the sky. The industry worked out that anything which passed a lap shear test with a force greater than a certain value would not fall out of the sky, so that became the standard test. So you may be surprised to know that modern carbon fibre aircraft spectacularly fail this industry standard test. So much so, that they had to design a new standard for such aircraft. Here's the explanation for this apparently worrying fact. Those who declared the lap shear test to be the industry standard were well aware that in reality it is a peel test. But it is an especially easy test to do and no plane that passes it has ever fallen out of the sky because of adhesion failure. But carbon fibre materials, although strong in shear mode (which is what is wanted) are useless in peel mode, so they fail what is in reality a peel test. For these aircraft they have to use a double lap joint test which is much more tedious, but happens to really measure shear!